Find the best broker for your needs. View and compare over 60 brokers. Earn up to 12.5% of your referred trader's rebates three levels deep. View and manage your own trading activity rebates and those you who have referred. Check out the bonus programs available with select brokers. Discover more about forex trading, the forex industry, and our company. New FxRebate partner broker: Vantage FX! New FxRebate partner broker: Destek Markets! New FxRebate partner broker: Deltastock! Termination of agreement with ThinkMarkets broker! New FxRebate partner broker: MEX Group! Cutting edge trading tools - account performance analyzers, economic calendars and calculators, school, forum and more. ZuluTrade was founded in 2007 by Leon Yohai, and created in response to the non-existence of a web-based platform that could audit traders globally and at the same time; enable traders to share their knowledge with people interested in their strategies. 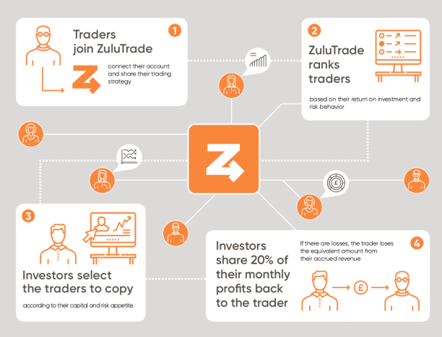 The ZuluTrade Platform bridged the gap between valuable information in money markets and trade execution by converting the advice of some of the most professional and talented traders globally, to a service which can rapidly execute trades. An additional advantage of the Platform is that it provides the ability and ease of driving selected trades to broker accounts of the interested parties. The concept of ZuluTrade is to offer an open environment, where traders on a global-level can connect any trading platform and share their knowledge. The first you need to Sign up for a free account. After free Sign Up you must Sign in to your account. Use the link(s) below to open a new real account. In your account panel choose "Add a Broker Account" and complete all fields. In this way your request will send to us and we will verify your account. Choose your payment method so we know where to send your Cash Rebate. All steps must be completed to receive Cash Rebate. The first you need Sign up for a free account. After free Sign Up you must Sign in in your account. If your account is an existing account and only have 5 days old you can send a request to Zulutrade for transfer your account to our partner group. Otherwise you should open a New Zulutrade Account by using a different e-mail address. In your account panel in "Brokers" menu complete all fields. Notify us of your existing account using the below link. *The Rebates are calculated for one round turn lot (100,000 units) for Currencies. **If your account is an existing account and only have 5 days old you can send a request to Zulutrade for transfer your account to our partner group . ***If you open a new account under our partner group on Zulutrade and your broker account is opened under another partner group then Zulutrade dont pay any commission to us from your trades. ****You cannot obtain rebates from FxRebate brokers and from Zulutrade for the same account. *****For other trading instruments rebate information please contact us at office@fxrebate.eu. HCMC (or Greek Capital Market Commission) is one of two regulatory bodies for the financial industry in Greece, the other being the National Bank of Greece. HCMC is responsible for the surveillance of the proper application of capital market legislation. It participates decisively in the formation of the capital market regulatory framework, on a national, European and international level, and contributes actively to the operations of the Council of the European Union, of ESMA and of IOSCO. Disclaimer: It is possible that you can lose all of the money you deposit, and in some circumstance you may even be required to deposit additional sums to cover you loses. By undertaking these types of high risk trades you acknowledge that you are trading with your available risk capital and any losses you may incur will not adversely affect your lifestyle. The high degree of leverage can work against you as well as for you. You must be aware of the risks of investing in forex, futures, and options and be willing to accept them in order to trade in these markets. Forex trading involves substantial risk of loss and is not suitable for all investors. Please do not trade with borrowed money or money you cannot afford to lose. This website is neither a solicitation nor an offer to Buy or Sell currencies, futures, or options. No representation is being made that any account will or is likely to achieve profits or losses similar to those discussed on this website. Any opinions, news, research, analysis, prices, or other information contained on this website is provided as general market commentary and does not constitute investment advice. Website owners and affiliates will not accept liability for any loss or damage, including without limitation to, any loss of profit, which may arise directly or indirectly from the use of or reliance on such information. Please remember that the past performance of any trading system or methodology is not necessarily indicative of future results. Trading foreign exchange, commodity futures, options, precious metals and other over-the-counter or no-exchange products carries a high level of risk and may not be suitable for all investors.